Roseau, Dominica – April 16, 2009………………Parliamentary Representative for the Portsmouth constituency and Minister for Tourism, Hon. Ian Douglas has said that the Labour Party Government is delivering to the people of Portsmouth. Hon. 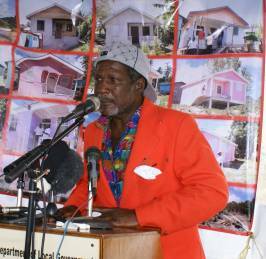 Douglas made the announcement at a ceremony in Chance, Portsmouth to hand over the keys of twelve (12) newly built homes, financed by the Government of Venezuela. “Like the Prime Minister likes to say, this is actually an activity that should have happened not only in our constituency but around Dominica twenty years ago. We had governments before this Labour Party Government headed by the Hon. Roosevelt Skerrit who actually made promises particularly to us in this constituency but these promises were never fulfilled and so I take particular pleasure in voicing and giving volume to the fact that this Government is actually delivering in a very tangible and positive way not only to the people of the Portsmouth constituency but around Dominica,” Hon. Ian Douglas said. The Minister also spoke about the deplorable conditions some persons in his constituency live in and of Government’s “legal and moral responsibility” to alleviate their plight. Hon. Douglas admitted that although it took some time for his Government to deliver to the people of the Portsmouth constituency, he knew that the Administration would come through for the people. The Portsmouth MP also expressed his gratitude and respect for the Venezuelan President, His Excellency, Hugo Chavez Frias. Hon. Ian Douglas, who became Parliamentary Representative for Portsmouth in December, 2000, following the death of his uncle, former Prime Minister, Hon. Roosevelt Douglas, listed a number of projects that have been completed in Portsmouth and a number of projects currently ongoing. These include: EC$2 million is now being spent on infrastructure in Chance; $1.02 million was spent on the construction of thirteen( 13) houses in Chance, Zicack and Glanvilla; $6.6 million on a new Indian River Bridge; $2.2 million on the Lagoon Bridge; completion of the Ma Wade Bridge and the sum of $7 million on the new Roosevelt Douglas Primary School. Over $500,000 has been spent on road infrastructure in Portsmouth, Chance and Glanvilla through the Portsmouth Town Council in the last two years. Government has committed the sum of $1 million for the new Cabrits Ecology and Heritage Centre. Government’s contribution towards the construction of the St. John’s Catholic School was $500,000. Work will commence later this year on a US$7.6 million Fisheries Centre in Portsmouth, funded by the Government of Japan. The Minister also promised even more development for the town in the future. “We are continuing to work for the people of Portsmouth, we are continuing to work for the development of Dominica. This Government has a programme of development, however slow it may have been in coming but right now we can see the outpouring of favour on this constituency. And it is a vision of development. And I can tell you for a fact there is more to come. There is in fact more development to come for Portsmouth…,” Hon. Douglas stated. In his address Hon. Douglas dismissed talk that the Labour party Government of Prime Minister, Hon. Roosevelt Skerrit is not following in the footsteps of the late Edward Oliver Leblanc. Addresses at the handing over ceremony were also delivered by Prime Minister, Hon. Roosevelt Skerrit, Minister for Housing, Hon. Reginald Austrie and Venezuela’s Ambassador to Dominica, Her Excellency, Carmen Martinez de Grijalva. The completion of twelve (12) houses in the Portsmouth constituency is part of Government’s Housing Revolution programme. One house was completed earlier and another two will be completed shortly. The Government has given the commitment to build more houses in the Portsmouth constituency in the next phase of the programme. The contractors on the programme in the Portsmouth constituency are Mr. Julian Hamilton, Mr. Ericson Thomas and Mr. Charlesbert John.